Looking for an adaptable, multipurpose vehicle with excellent handling? Manoeuvrability is key to the design of the three-wheeled Traigo 48, allowing easy operation in the tightest of situations. 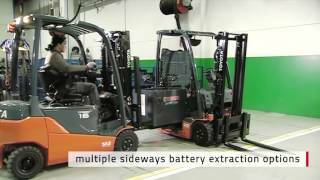 Our electric counterbalanced trucks are as effective working inside within pallet racking aisles as they are working outside in the yard or in a loading bay. Excellent visibility of the fork tips at any height for safe and confident driving and load handling. Unique to Toyota, this system actively manages truck stability to deliver class-leading safety and productivity. Mini levers in the armrest offer smooth, fingertip control of lifting, lowering, tilting and side-shifting functions. The multifunction display gives key information at a glance and allows for parameter setting to suit driver or application needs. The clear-view mast and overhead guard gives operators an excellent view of the load and environment. 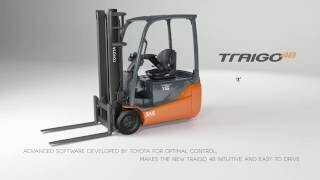 Available as 3-wheel models for high manoeuvrability or 4-wheel models for more stability on uneven ground, the Toyota Traigo 48 forklift series are designed for intensive indoor and outdoor use. They are class-leading in safety, productivity and energy efficiency, even more so thanks to the optional lithium-ion battery technology. The Traigo 48 models are also available with cushion tyres for narrow applications indoor.